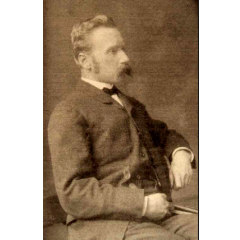 We have now returned to Madelvic, the legacy of Sir William Peck (1862 – 1925) who was a Scottish astronomer, scientific instrument maker, and a prolific inventor. 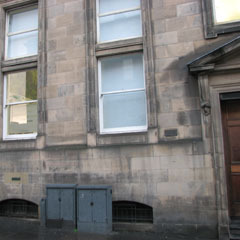 He was the director of the Edinburgh City Observatory from 1889 until his death in 1925. Peck was elected a Fellow of the Royal Society of Edinburgh and a man with vision: not only did he invent telescopes (one can still be seen in the Stirling Highland Hotel) but he also came up with the idea of an electric car, a most astonishing concept in 1899. 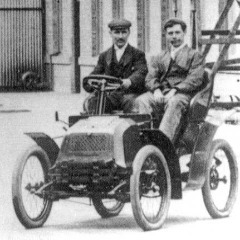 This electric car, which he named ‘The Brougham’, was produced in this factory building. It was driven by a three-wheeled tractor-style front axle unit, comprising a motor, batteries and a small central wheel, set behind the axle, which propelled the vehicle. This unit was mounted to the front of a chassis, creating a five-wheeled automobile and could be attached to any horse-drawn carriage. To gain publicity Peck used it to provide public transport between Granton and Leith. For a brief period, the Postmaster General of Edinburgh employed Madelvic to carry the mail between the General Post Office and Leith. 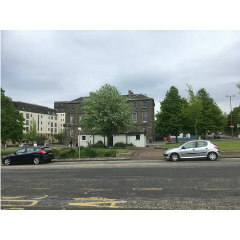 The fifth wheel is such an iconic design, Peck had it incorporated into the façade of the office building, Madelvic House, which is now the base of granton:hub. 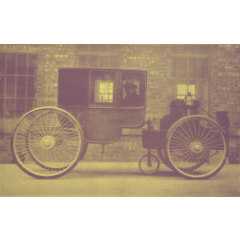 The Brougham, From the granton:hub collection, illustration taken from The Madelvic Motor Carriage Co. Ltd. original brochure, 1899 (42pp). 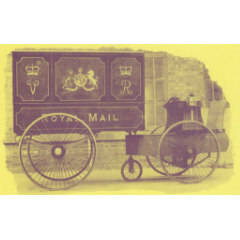 The royal mail delivery between Leith and Graton, From the granton:hub collection, illustration taken from The Madelvic Motor Carriage Co. Ltd. original brochure, 1899 (42pp). 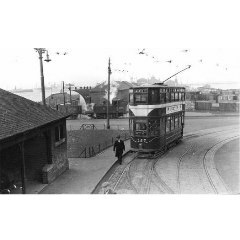 The first tramline in the Granton area dates from 1909. This system used a moving steel cable located just below the street, powered by stationary steam engines. The tramcars had no motors of their own – they moved when the driver – or ‘gripperman’ – used vice-like jaws to clamp the car to the moving cable. 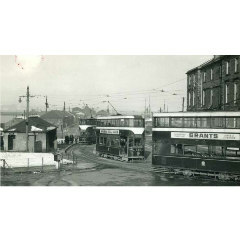 Granton Square was once a very busy tram terminus, with trams leaving Granton to travel throughout the city. The Edinburgh system was converted to electric operation between 1922 and 1924 and the tram routes were re-organised to give longer through-routes. Many remained largely unchanged until the end of tramway operation, in 1956, and some Lothian buses still follow the old tram routes. 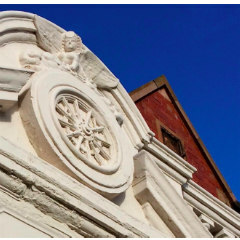 This Victorian red stone building was the original office of The Madelvic Motor Carriage Company. 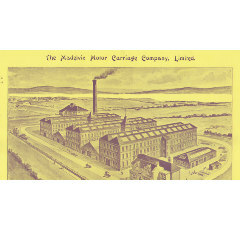 Founded in 1898 by William Peck, Madelvic was one of the first Scottish motor brands built in the first British purpose-built car factory. 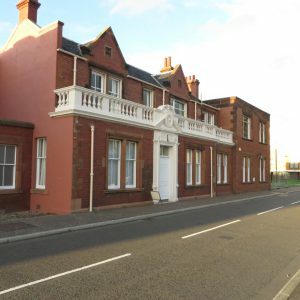 After the company was liquidated in 1900, a string of other vehicle manufacturing companies used the factory, including Kingsburgh Motor Company, Stirling’s Motor Carriages LTD, Scottish Motor Works, and the Scottish Motor Engineering Company. 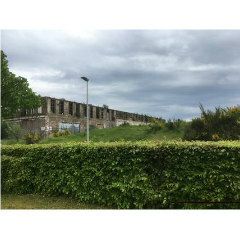 By 1912, vehicle production on the site ended and during WWII the factory was used for storing torpedoes. 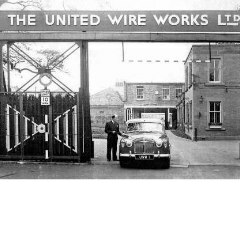 United Wire, a wirecloth manufacturer, moved into Madelvic House in 1925 and has been a part of the community for more than 175 years. Today, United Wire’s factory and offices are across the street from Madelvic House. Restored as his publishing house by Patrick Geddes, activist, sociologist, Professor at Bombay University (1919-23), who corresponded on education with Nobel prize-winner Rabindranath Tagore, this was also a pioneering student hall: medical students from Mauritius and Madras stayed here in 1896. Riddle’s Court also hosted a 1598 banquet for the Duke of Holstein, brother-in-law to James VI: £600 (2016 money), was paid to William Flebairn for spices. 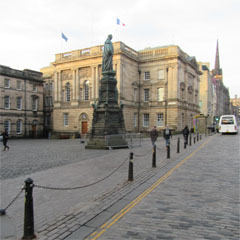 Further down the Royal Mile, in what is now the City Chambers, in 1798 John Caird advertised ‘real India curry powder, in the original package’ at £18 (2016 money). 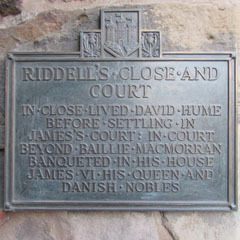 Plaque comemorating a banquet of James VI’s time. 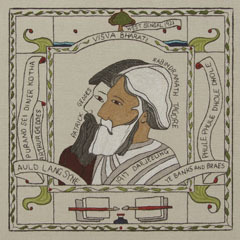 Tapestry showing Patrick Geddes and Rabindranath Tagore meeting in Darjeeling. 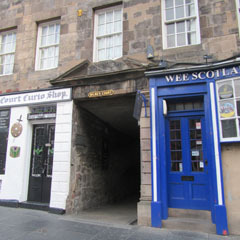 In the 1690s Scots spent over £9,000,000 (2016 money) on Eastern goods, and in 1695 the Scottish ‘Company Tradeing to Affrica and the Indies’ was licenced. 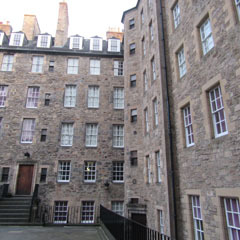 In 1696 here in Milne’s Court lived seven investors: merchant James Balfour; Deans of Guild McLurgg and Allan; solicitor Cunningham; Alexander Gibson; and apothecary Miln. Their neighbour James Byers furthermore succeeded in being made governor of the Company’s ill-fated Darien trading post. The Company’s failure led to painful losses but after 1707, investment opportunities in the English East India Company were extended to Scots like portrait painter Allan Ramsay of nearby Ramsay Gardens. The Darien Chest which held the money and documents of the Company of Scotland, now at the National Mueum of Scotland. Commercial rivalry and anger over English involvement in the failure of the Scottish ‘Company Tradeing to Affrica and the Indies’ boiled over into political violence in 1704. The ‘Worcester,’ an English East India company ship was impounded in Leith in retaliation for a Scottish East India ship confiscated near London. 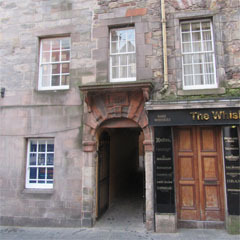 In revenge for another Scottish India ship taken by pirates off Madagascar, three members of the Worcester’s crew were incarcerated in the Tolbooth and on little if any evidence convicted of that act of piracy and hanged on Leith Sands. 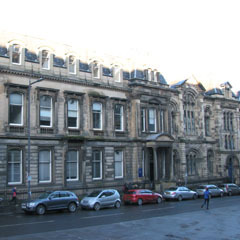 Seven jurors were shareholders of the Scottish India company. 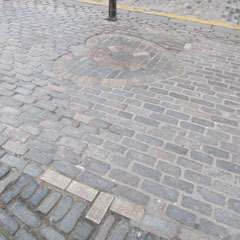 Mosaic of Heart of Midlothian with outline of the condemed men’s cell. 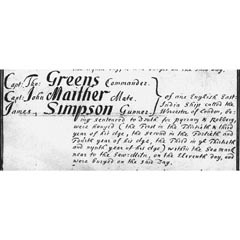 Burial Record for Captain Thomas Green at South Leith Church, 1705. 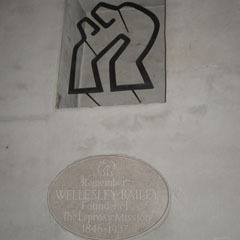 Wellesley Bailey, born in Ireland 1846, went to India in 1869. As an American Presbyterian Mission teacher, he visited some lepers’ huts in Punjab and decided to care for them and proselytise. 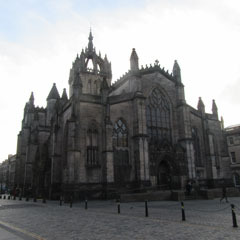 Moving to Edinburgh in 1882, Wellesley became a lay-missionary with the Church of Scotland, and 1886-1917 ran the Mission to Lepers in India. When he retired, the Mission was working with over 14,000 leprosy-affected people in 12 countries. 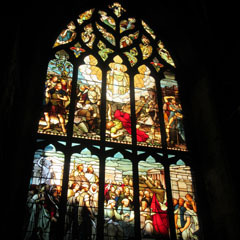 Brothers James (1807-72) and Duncan Monteith (1812-74) got rich sellling leather goods at the best addresses in Calcutta and their family commemorated them with large memorial windows opposite each other. 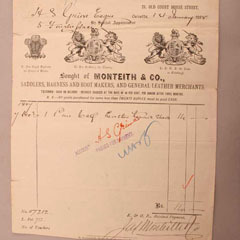 Receipt from Monteith & Co. for 1 pair of leather tennis shoes. 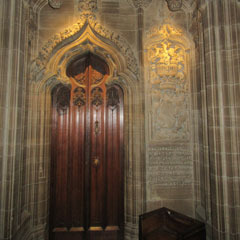 There are some striking examples of India links in this sacred meeting place of Scotland’s chivalric order. Counting counter-clockwise from the entrance, stall 13, find arms (bottom middle) for the 2nd Marquess of Linlithgow, longest serving Viceroy 1936-43, during the World War Two suppression of Independence movements and the death of millions in the Bengal Famine. Stall 17 bears the arms (top middle) of the 14th Duke of Hamilton, in 1933 the first to fly over Mount Everest. At stall 7 we find (bottom right), with Ashoka’s lions hinting at Indian heritage, Dundee obstetrician Narendra, Baron Patel, in 2009, first Asian in the Order’s 322 years. 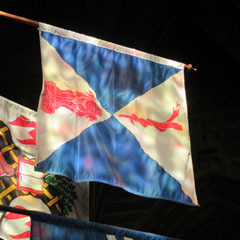 Baron Patel’s Flag with Ashoka’s Lion Column. 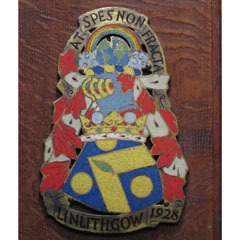 Marquess of Linlithgow’s Coat of Arms. 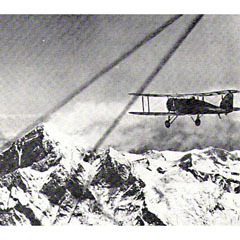 Duke of Hamilton’s flight over Everest, 1933. First mentions of Indians in Edinburgh appear in newspapers. In May 1753, a reward is offered for John Samson ‘East-Indian […] Moletto [Anglo-Indian] Boy’ servant/slave ‘run off from his master in Edinburgh’, possibly with a missing silver watch. 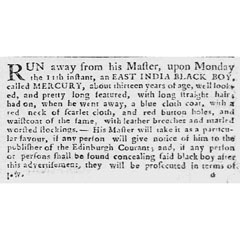 In 1769, advertisements are published for Mercury, ‘East India black boy about 13’. 1771, Caesar, a trained Indian chef (16), escaped a stately home near Dingwall and was searched for here. In the 1870s, basket weaver Khuda Baksh, and tobacco pipe seller Roshan Khan, his Scottish wife and five children, lived in the High Street. 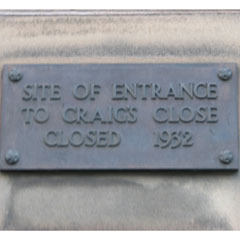 Others, often Lascars (sailors), lived in Leith. Advert in the Caledonian Mercury, 4th October 1769. Here lived (1725-1878) the Elliots of Minto, important East India Company shareholders. The first Earl was Governor-General of India (1807-13), one brother was assistant to Warren Hastings, another was Governor of Madras. The 4th Earl became Viceroy (1905-10). After their house was demolished in 1878, the present building was erected. Elsie Inglis’ Women’s Medical College (1889-1908) was based here: Of 185 women it trained, at least 20 were born in India, and 46 worked there, including Hilla Furloonji Batliwala (nee Banajee); Kadambini Ganguly; Khorshed Sorabji Kanga; and Meher Ardeshir Dadabhai Naoroji (niece of Dadbhai Naoroji, the UK’s first Indian MP). 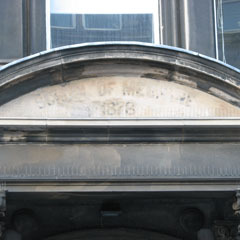 Shadow of Medical School sign on the pediment. 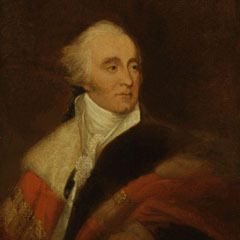 Portrait of Gilbert, 1st Earl of Minto, 1820s.